Pekka Haavisto is very well-known in Finland as a Green leader. He has been a member of the Parliament of Finland from 1987 to 1995, and chairperson of the Green League from 1993 to 1995. He served as the Minister of the Environment in Paavo Lipponen’s first cabinet between 1995 and 1999. After a long break, he came back to the Parliament in 2007, and was reelected in 2011. He was the Green candidate in the 2012 presidential election, was second in the first round of the election, and got 37,4 % of the votes in the run-off. 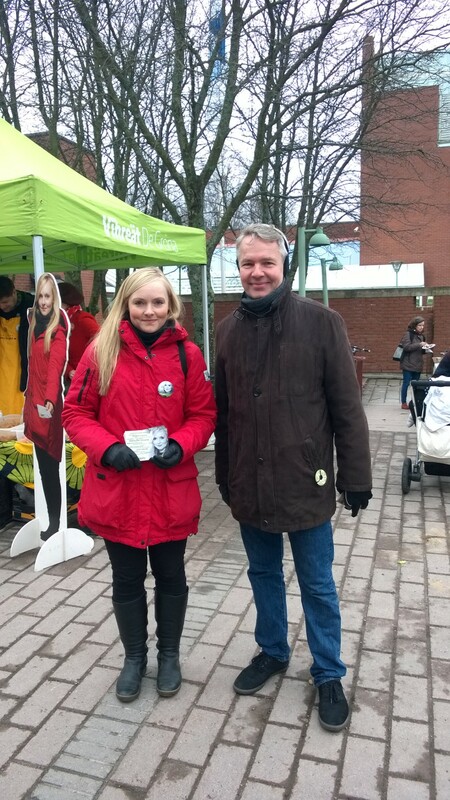 He is supporting young promising young politicians and has given an interview to Finland Politics at an event in Itäkeskus, where he was supporting Maria Ohisalo, another green candidate for the elections (on the picture with him). Well, I was one of those who were very early in environmental activism during the ‘70s. I have been in Koijärvi, it is one of the major activists’ happenings for the Greens in 1979, and I was establishing some of the very early Green magazines, and I was a journalist, actually, as a background. And then, I took part in the first elections, first without even the name of the Greens, because we didn’t have any Green party. I was an individual candidate. In 1987, I was elected for the first time. So, green activism was your reason to go into politics? It was green activism. We were very much at the same time as the German Greens, moving towards the Parliament. I was the first European Green minister, before Joschka Fischer. A couple of months before the German elections, the Green Finns went to the government. So actually, we have been known in the world also, because there was a very strong opinion that “the Greens are always an opposition movement, and you know you are not capable of coming to the government positions et cetera”, and then we entered the Parliament, and we entered even the government in 1995. So, I’ve been involved, quite from the beginning. How is the Greens’ campaign going? I think, at the moment, it looks good, actually—for the first time, maybe, the Greens are active in places in the country where we have not been so visible, for example North Karelia, Joensuu, Oulu. I feel that it’s a very, very good campaign ongoing. And in Jyväskylä, at the Book Fair, the Greens were very dominating there. Also in Lahti, in Southern Häme and so on, and I think there is quite a good mood among the Greens, and now the real campaign work is ongoing. We have, of course, candidates also in the countryside who are for the organic farming, or for new working options in the countryside, not only in farming, but small enterprises and so on. And I think this message is very important: that if you want to save the countryside, it’s not only the traditional farming. It’s the new farms. It’s organic farming, clean products, clean food products, and so on. And this actually gives new working opportunities. I was, last summer, in one of these rural seminars in Kuru where, actually, these kinds of things are discussed. We had the Green entrepreneurs in a very small location in the Northern Häme. I was actually so proud to see that there are so many new initiatives, and so many new ideas ongoing in that area. Do you believe in the development of biofuels based on the forests in Finland? Well, forests and our natural resources, of course, will be part of the Finnish economy also in the future. But it’s always a combination, with the new technologies, clean tech, all those renewable energy forms that we can produce, and so on, and then, of course – I hope so – more using the biomass for energy products, and using the forest, not only for paper and pulp, but also, to a certain extent, to produce clean energy in Finland. Well, of course, the discussion started very much from this monoculture cultivations, in those eucalyptus forests and others, all destroying the tropical forests in places like Indonesia and Brazil for example. But of course, Finland is very different, and we are not bringing any strange species to our forests or anything like that. We are actually using our normal forests, also, to produce biomass. And of course, now, as you know, we have part of our fields that are not in use. We have all these unused cultivation areas, which are not used even for food production and where we probably could grow and cultivate, also, energy products—material for energy and plants for energy. What do you think are Finland’s main challenges for the next years? The two topics of these elections are economy and security. And with economy, I’m thinking that we have seen Nokia; we have seen the IT. Where we should head to, of course, now, are the clean technologies, energy-saving technologies. We have a lot of competence in those fields. And these are very much linked, also, to the IT sector and so on. And vis-à-vis the security, of course, I’m concerned about new tensions around the Baltic Sea area, of course, the Ukraine and Crimea, but also the rises of very radical Islam—these movements like ISIS in Syria and Iraq. And I think Europe has to concentrate more, also, on its own security in the future. And as a Green, I’m thinking very much of a concept of the European security, Nordic cooperation and European security that could be improved. What is your feeling about the evolution of the situation in the Ukraine? Well, of course, I hope that the Minsk II agreement will hold. It’s a bumpy road, but it’s better than no agreement at all. And I think that OSCE is our European body that could and should send observers to the region, and verify that the ceasefire is respected. And in that sense, I hope that Finland will be proactive on the humanitarian side, and on the peacekeeping or observer side, in Ukraine. So, let’s hope the best. But of course, it was quite scary, particularly when I’m talking to our Baltic friends, as they have, inside their country, a Russian minority, whose opinions could be influenced by Russia in the current situation. I can see that also, these tensions inside the European Union are quite high now. And what about the sanctions? Is there a special position of the Greens on this topic? There is. I was in the government; I was a minister when the sanctions were put on the first time, and wWe agreed with the European peaceful reaction to the violation of the international norms done by Russia. And I think the sanctions can be lifted when Russia does not support separatists in the Eastern Ukraine anymore, and when Russia is out from the Crimea. Of course, leaving the Crimea will be a long way. There are some differences on a number of points between the Greens and the rest of the political groups. On what conditions would the Greens be participating in a coalition, from your personal point of view? Well, of course, Finland has always coalition governments, and one of the issues is that we want to have a government program which definitely is pro-environmental issues. We don’t accept building of the new water power stations, which is planned now in Northern Finland. We don’t accept the building of new nuclear power plants, the Fennovoima decision was the reason why we left the government recently. So, these are the issues that , in any government program, we are not supporting. Do you think that the Centre Party would be ready to let go of the construction of new nuclear plants? Very difficult to say. It’s possible that we will find ourselves in opposition, but it’s very much a question, also, of what kind of coalition around the Centre Party will be formed. And it’s too early to say, because the election result will define that. If the Social Democrats get enough votes, and so on, and so on—it’s speculation, what kind of combination the government will have. Yes, we have many young candidates, in Helsinki and all over the country. And of course, Greens have always traditionally been quite strong in the university cities. But now, we have the first chance, I think, to get candidates to be elected in other places, such as Lohja for example. So, it’s very likely that the Green group is now growing. I would say—now we are 10. We will be minimum 13, hopefully more. There is also a generation among the Greens who is leaving? Yes, of course—well, nobody’s leaving, but basically, I think, new candidates are coming. And of course, yes, there is goint to be, of course, a change of the faces in the Parliament group. People like Osmo Soininvaara and Tuija Brax, long-term parliamentarians, are leaving. But I think that’s quite natural. In the very beginning, we had a very strict rotation principle. You have been a long time among the Greens. Have they changed over these years? Of course, at the very beginning, the basis of the Greens was mainly in the university cities, and that support has been coming stronger. But new areas and new people are coming in. I think that we have now more experts in the Green group. We have more different age groups . We have even the Green pensioners’ organization nowadays; we didn’t have it in the beginning! But these new people coming in, that is very positive. You have been in a presidential election as a candidate. How is it to go back to campaigning like this? Well, always you have to come back to the grassroots level, always, always, again and again. In politics, you cannot stay there, you know, it’s very risky!